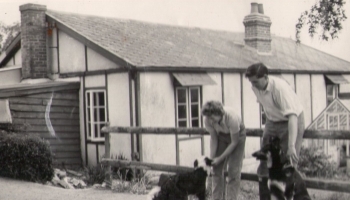 Mary and John moved to Burrow Farm in 1959. John built up a dairy herd while Mary started making a garden with the help of her four young children. The old roman clay pit (now The Woodland Garden) was deemed unsuitable for farming and Mary therefore started to clear the brambles to create the first part of what is now a 13 acre garden. There is a timeline of how this wonderful thirteen acre garden was created from scratch in 55 years. 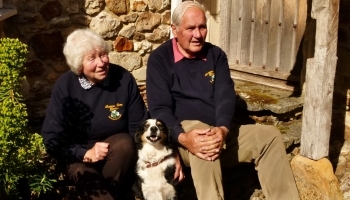 John and Mary Benger have lived at Burrow Farm Gardens (originally just Burrow Farm) since 1959. Originally a traditional working farm with a dairy herd, Mary had other plans for its future. With a herd of cows to feed every bit of field was invaluable and Mary therefore had to start her garden in the old roman clay pit which was covered in brambles and seemingly no use to anyone. John remained a dairy farmer up until 1983 however Mary had been stealing bits of the field to turn into garden for several years previously. 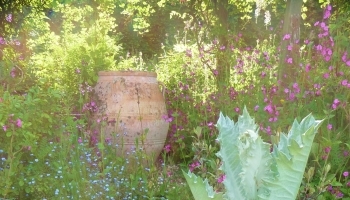 East Devon’s Secret Garden is open from 1st April to the 31st October These beautifully landscaped gardens, extending to thirteen acres, feature superb views of the surrounding countryside which provide a fitting backdrop to the spacious lawns, lush borders and unusual shrubs and trees. Whether you are a keen gardener or pausing on your journey to the South West, you will find a peaceful oasis with extensive rural views. Season tickets are available for £21 per person for a season (1st April – 31st October). This allows you to visit East Devons Secret Garden throughout the season for a one off price. From the first bulbs in the spring to the stunning Autumn colour in October you won’t miss a thing with a season Ticket at Burrow Farm Gardens. Tickets are for sale at the gardens or by post as the perfect gift for a garden loving friend.